Antique Code Show Tomohiro Nishikado already had a string of almost a dozen arcade games under his belt when he started on what was to become the best remembered - certainly the most played - game he was ever to create: Space Invaders, released in Japan 35 years ago this month. Nishikado was an engineer who had joined vending machine company Taito in 1969, not long after graduating. Taito's managers put him to work on mechanical gaming machines, called Pachinko by the locals, but in 1972 he devised the company’s first electronic offering, a take on Atari’s popular Pong. Released in 1973, Nishikado's Elepong was a something of a hit, and he went on to create a number of other video games, including Speed Race, a top-down scrolling car racer released in 1974, and Interceptor, a cockpit-view aircraft combat game that came out the following year. Having said that, Nishikado had created Western Gun for Taito two years previously. Western Gun, a two-player affair released in the US as Gun Fight, was the first video game that challenged the player to shoot representations of people. Taito didn't seem too bothered then - so why kick up a fuss in 1977? Western Gun is essentially Pong with bullets instead of balls, and cowboys instead of bats. 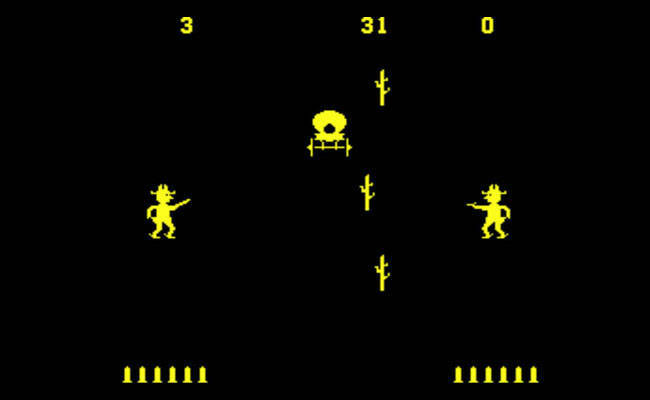 Static cacti and moving stagecoaches can be seen as early takes on Invaders' protective blocks and moving UFOs. George Lucas’ film wasn’t Nishikado’s only inspiration. Seeking out possible monsters, he hit upon the brain-and-tentacles Martians from HG Wells’ War of the Worlds. This gave him the notion for an octopus-like creature and, in turn, got him thinking about other possible sea beasties. “I came up with a squid and a crab. My favourite is the crab,” he revealed back in the 1980s. Pencil sketches of the aliens were refined to yield each alien’s basic design which was then simplified into pixellated equivalents, with a variation of each added to provide a sense of animation.